Welcome to the top of the hill. Take a little peek over the edge. The view from here is breathtaking! 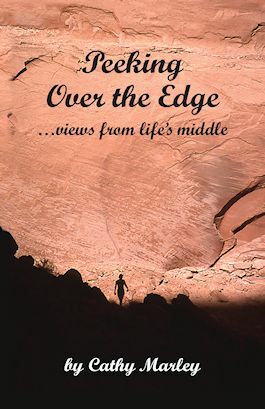 Written for baby boomers who are "not-so-far-over-the-hill", Peeking Over the Edge ... views from life's middle looks at midlife as the beginning of life's best half. It is one woman's view of the regrets and triumphs of the past balanced by eager anticipation of a future built on wisdom gained along the way. I wrote Peeking Over the Edge when I realized I could choose to never be over the hill no matter what my age. 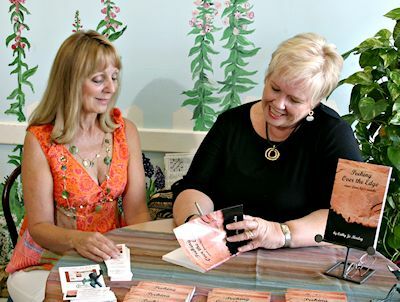 It is a book for anyone who, preferring to explore the marvelous possibilities that come with each passing year, wants to make the same choice. It is for you. For me, middle age was the start of life's best half. As I approached my 50th birthday, I found myself letting go of old expectations about who and what I should be. It was an incredibly empowering experience that left me wanting to soar high and far as I tested my wings on the breezes of limitless possibility I had discovered. Peeking Over the Edge is a collection of my reflections as I explored the unfamiliar territory of my own middle-aged heart. I like to believe my experiences will strike a familiar chord in the hearts of my readers, whether they are 20 or 120 (it is possible!). © Copyright 2006 – 2018. Cathy Marley. All Rights Reserved.